Hello! I'm back again with another day of Lawn Fawn Inspiration week. Today we are featuring the super cut set Monster Mash…perfect for halloween but just for fun as well. I have two projects to share today! 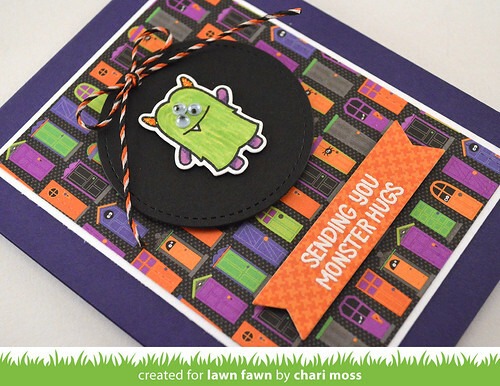 This first project uses some fun Doodlebug halloween paper, I love these little doors, reminds me of Monsters Inc. I colored my monster with copics and used the coordinating dies to cut him out. I used the stitched circle from the Stitched Party Banners die set to cut a black circle for my monster. I added some googly for some extra fun and some of the new Spooky Lawn trimmings twine to embellish. My second card today was inspired by the monster image itself, I thought this particular monster was very similar to the ghosts in Pac-Man. So I colored four monsters with copics to look like Pinky, Blinky, Inky and Clyde. To create Pac-Man I stamped the moon from Happy Haunting and drew in the mouth using the corner of a piece of paper as my guide. 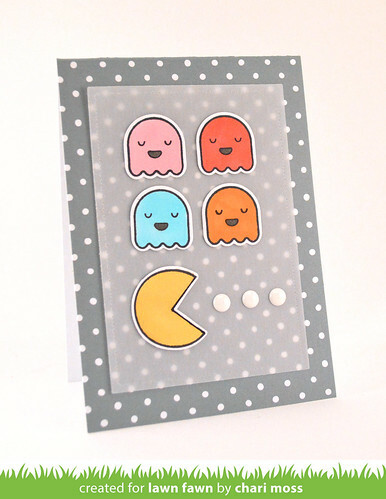 I picked the grey hippo notecard thinking that the dots look a lot like the Pac-Man board. 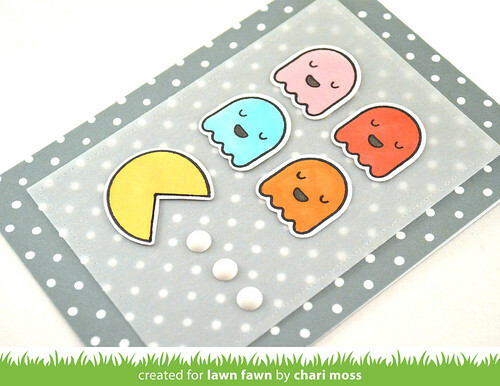 I die cut a piece of vellum with the Stitched Rectangle dies to frame my characters and added a few white enamel dots for Pac-Man to gobble up. 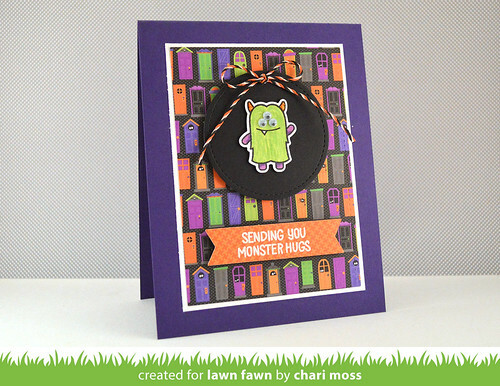 Be sure to check out the Lawn Fawn Blog for more Monsterous projects as well as giveaways! Matt and I were challenged by both our Fawnie friends at Lawn Fawn as well as Britta Swiderski to take the ALS ice bucket challenge. So we did…and had some fun along the way. :) Enjoy and donate! These cards are adorable!! The Pac Man one brings back memories of childhood for me!! I love the Pac-Man card! It would also look good on a maze-like background. What great cards Chari! I love the vintage Pat - man one especially! SO CUTE! And the Pacman card...genius!!! love these. the PacMan is too clever! Beautiful cards, I congratulate you on your talent !!! I absolutely love the Pacman card! Papertrey Ink recently had SAF 2014 and they featured a set from the 80's. I am totally digging the retro themes! Really loving all your monster cards! Btw: your challenge video was funny! Great cause to support. Thank you!